BPMN Gateways - How to Use Them? Gateways are used to control the flow of the process and define ramifications in a BPMN diagram. Learn what they mean and how to use them. Gateways in a BPMN diagram are used to control how the process flows. In BPMN (Business Process Model and Notation) diagram, only sequence flow will affect the flow of the process, and message flow should not affect the flow of the process. This article will show different type of gateways and how to use them in a BPMN diagram. A Gateway is represented with a diamond shape and determine decisions, merging and joining of paths. These are the common types of BPMN gateways. BPMN Gateway is a kind of flow objects that is used to direct sequence flows of a process based on certain condition. It serves as a gate, it will determine whether to let a certain flow pass, therefore gateways possibly control the selection of outgoing flow that pass through the gateways. Now we will explain each type of gateways in detail. An exclusive gateway evaluates the business process and leads the flow into one of the two or more mutually exclusive paths and directs the flow exactly to one of the output branches. In the example above, an exclusive gateway requires to evaluate whether to hire the candidate or not. In this case, the candidate will get hired if satisfies the requirement, and will be rejected if not satisfied. An event-based gateway is similar to a exclusive gateway because both involve one path in the flow but the trigger of the gateway is base on event occur instead of evaluate condition. In the case of using an event-based gateway, you need to evaluate which event has occurred. Parallel gateways are used to represent two tasks in a business flow. A parallel gateway is used to visualize concurrent execution of activities. We the process arrive to parallel gateway node, the work will split into multiple token and will merge when reach to the joining parallel gateway. Above in typical example of parallel gateway. A Parallel Event-Based gateway is similar to a parallel gateway. It allows for more than one process to happen at the same time. The difference from a parallel gateway is that the processes are dependent from one another. At parallel event-based gateway, multiple events can trigger multiple processes, but the processes are still dependent from one another. An inclusive gateway leads the process flow into one or more flows. 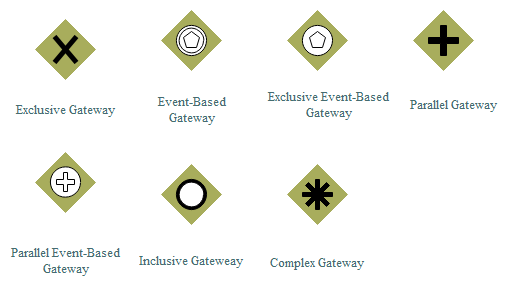 Inclusive gateway is also a division point of the business process because it can trigger more than 1 out-going paths. All active input branches must be completed before going on another gateway. Complex gateway is used to model complex processes. If you need multiple gateways to describe the business flow, then that's an ideal case for the complex gateway. Complex gateways need more descriptive text because you're using words in place of symbols. Complex gateways allow a greater flexibility in flow control.